Ultimately, you are unelaborated great bliss: Samantabhadrī. Venerable noble mother Tārā is Kuntuzangmo,Tib Samantabhadrī,Skt in the sphere of the dharmakāya2, Dorje Phagmo,Tib or Vajravārāhī,Skt in the sphere of the sambhogakāya3, and Ārya Tārā in her nirmāṇakāya4 form. Dorje Yangchenma, Tib and Lhamo Palchenmo,Tib are among her many other manifestations; each has a different name and form. In the Land of Snow, (Tibet) in particular, beings are benefited by her other inconceivable manifestations, specifically, Yeshe Tsogyal, Ye śes mTsho rgyal,Tib or Jñāna Ḍākinī5.Skt Just by praying to her, with the help of her swift action, we can spontaneously accomplish the two purposes6. Therefore, it is of great benefit to persevere in this practice. There are many different Indian and Tibetan traditions explaining this “tantra7 of praise”. Motivated by devotion, I will explain this tantra in accordance with “The Treasure Vase of Essential Great Bliss of Inner Practice”, which is the profound mind-treasure8 teaching of the omniscient Rigdzin Jigme Lingpa. Each of the twenty-one verses is praise to twenty-one manifestations. 1 three kāyas skt ~ Dharmakāya, Sambhogakāya and Nirmāṇakāya, the differing dimensions (bodies) in which the embodiment of fully enlightened attributes occurs. 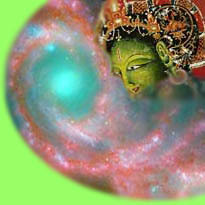 2 Dharmakāya skt ~ Buddha body of reality. 3 Sambhogakāya skt ~ Buddha body of enjoyment. 4 Nirmāṇakāya skt ~ Buddha body of emanation. 5 ḍākiṇī skt (mkha’ ’gro, Khandro) ~ Literally, sky goer. A yoginī who has attained mundane or supramundane accomplishments, specifically, enlightenment. 6 two purposes ~ To benefit self, and other. 8 mind treasure ~ An inspired teaching (gter ma, Térma, nidhi skt) revealed directly from the Buddha-mind, by a treasure revealer, (gter ston, Tértön).